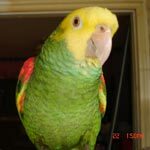 Parrot Forum • View topic - African Grey Escaped! My grey has unfortunately escaped, the wind blew my door open which I thought was closed, making him panick and escape. Is there anything I can do to lure him back? How far should I look? He has never been clipped and was quite a flyer at home, so I do not know how far to look for. Any indication? Also, he is very afraid of people except family members, aged about 2.5 years old. About 10 hours has passed so far. Any helpful tips would be appreciated. You have to go out there and stay out there looking for him from dawn to dusk because, normally, they don't go far the first or even the second day but, if he doesn't s ee or hear you, he will panic and fly off Put his cage outside with seed scattered on the floor of it and the door open. Get binoculars to see up in the tree of the window, ledge, etc [he will be high up where it's safe] Get fliers done and place them everywhere in a 3 mile radius and pot in parrot911 both the site and the facebook page and on CL. Call Animal Control and the local AsPCA to let them know. Good luck! You have the advantage that he can fly. Myrtle was sucked out the door by a high wind. She managed to grab a twig and hang on while calling me to get her. The wind was still strong and she could not get back to me. Keep calling. Dawn and dusk are the best chance you have to get your voice to carry. I'm so sorry. I know exactly what you're going through and I'm sending you a big e-hug. If I were around I would help you look. Scan the area and call, call, call. If there is a certain call you use with the bird, please keep calling. Look everywhere, up in the trees. Have friends help you look. Do you live in an urban area or in the burbs, or rural? ?